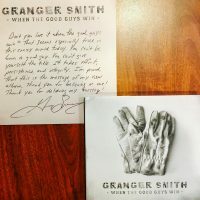 Granger Smith dropped his brand new album, When The Good Guys Win today and it’s something I highly recommend you listen to. With 14 tracks, you’ll not only hear Happens Like That but also Don’t Tread on Me featuring Earl Dibbles Jr plus everything in between from up-beat catchy hooks to slow ballads that tear on your heart-strings. Listen to what Granger has to say about the album below.